In African emerging markets (AEMs), the prevailing notions of social responsibility (SR) are based chiefly on Western ethics. Even discussions of corporate social responsibility (CSR) have, more often than not, been couched in the similar manner. Consequently, the field of CSR in AEMs is largely unaware of Setho ethics that for it are germane as a basis for thinking and talking about SR. In this chapter, the author proposes Setho ethics rooted in Botho, which sees the communal, interdependence and interrelatedness of beings, as an alternative vision of CSR in AEMs. In fact, people in Sub-Saharan Africa (SSA) see themselves in a symbiotic relationship with society, a point well-articulated by Mbiti (1969, p. 24) thus, “I am because you are, and since we are, therefore I am”. This African view through the Setho ethics lenses generates a different notion of an ideal SR of business to society worth illuminating in the CSR discourse today. In African emerging markets (AEMs), ethical consumerism is a growing phenomenon that underpins ethical trade activities of business (Boluk, 2011; Blowfiled & Dolan, 2008; Darkwa, 2014; Dolan, 2005, 2010; Hughes, et al., 2012; Tallontire et al., 2001; Tustin & De Jongh, 2008). Consumers are increasingly making ethically conscious decisions regarding the consumption of products and services they obtain from business (Busch, 2014; Johnston et al., 2011; Smith, 2008; Tallontire et al., 2001). Therefore, an increasing number of consumers make their consumption decisions on the basis of ethical values (Grauel, 2014; Pecoraro & Uusitalo, 2014; Tallontire et al., 2001). Such values include, but are not limited to environmentally friendly products and production methods; labour standards (wage rates and working conditions); and human rights (Tallontire et al., 2001). Indeed, the demand among customers for ethical products and services is certainly growing, intensifying the ethical and social pressures on business to behave in a socially responsible manner (Connolly & Prothero, 2008). Under these circumstances, business can no longer afford to ignore their social responsibilities or take them for granted. 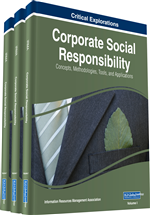 The message is currently clear, “A statement of corporate social responsibility (CSR) is a must-have accessory no large company wants to be without” (Thomas, 2005), at its’ own peril. These days, ethically-attuned consumers want business to undertake ethical business actions that benefit them and their immediate communities first and foremost. From an ethical consumerism perspective, the concept of CSR is based on perceptions or recognition about business that: Firstly, it is part of society. Secondly, it has the potential to make a positive contribution to societal goals and aspirations. It is within this regard that Ponte, Richey and Baab (2009) refer to CSR as the continuing commitment by business to behave ethically and contribute towards societal goals and aspirations. Hence, CSR is seen as a compelling business moral imperative or phenomenon that business cannot afford to ignore any longer (Rossouw & Van Vuuren, 2003), particularly in the AEMs. Both, the impact of ethical consumerism and the influence of socio-ethical social pressures on CSR practice are increasingly becoming compelling change agents on the relentless calls for business to behave in a socially responsible manner. Indeed, they can be now legitimately taken to be established matters of fact in CSR discourse in AEMs, although the extent to which these developments impact on business practices in these markets remains unclear. What is yet to emerge, however, is an African normative grounding that provides accepted moral basis for the practice of CSR in AEMs, and legitimises the socio-ethical pressures that encourage its development in these markets.